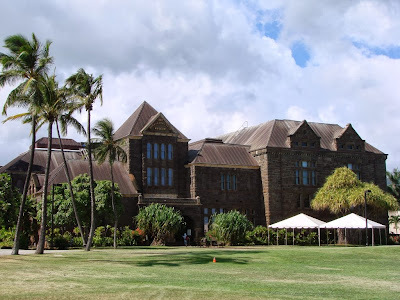 We end the week on the grounds of Bishop Museum. One afternoon I was there and noticed that there were no people outside so I figured it was a perfect time to snap a picture of the Hawaii / Polynesian Hall. I just wish those white tents and the orange cone weren’t in the photo. Some how no matter how bad the day has gone I always find it comforting and relaxing to head down to the beach to watch the sunset. 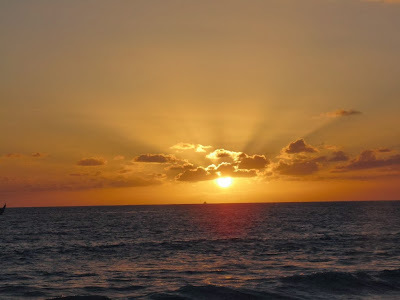 Here is one taken at Ala Moana Beach Park which is just minutes away from my office. There is an extra orange glow thanks to the vog (caused by smoke from the volcano) in the air. On President’s Day I managed to complete my 6th Great Aloha Run. This is an 8.15 mile race from Aloha Tower to Aloha Stadium. I clocked in around 1:47 which was a pretty good time. This is the 30th year for this run/walk event that raises money for various charities. 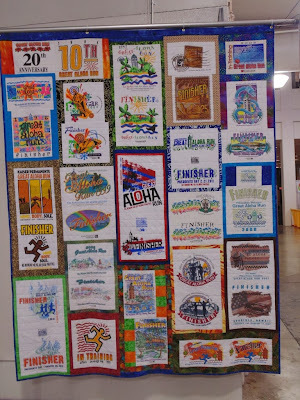 Prior to the race at the Health and Fitness Expo they had this display of some of the past years finisher shirts made into a giant quilt. If you’re in Hawaii next year you should join in on this great event that annually has between twenty and thirty thousands participants.